Today I want to build upon the last post surrounding Intune and certificate services. Once we get the certificates onto the devices the next step is to configure our services to accept certs as a form of authentication. I want to talk about configuring Exchange Online in this post and some caveats when setting that up. Per usual I dont want to spell out a guide for everyone. Those can be found in a multitude of places. There is a good one here. What I do want to talk about are some of the gaps that this guide didnt cover. $Cert=Get-Content -Encoding byte "Location of Root CA CER file"
To this "$New_CA.AuthorityType=1" this will specify the cert we upload as the Int. The next little gotcha they don't mention is that ADFS certificate based auth goes over a different port. It goes over port 49443 so make sure you aren't blocking that port coming into the WAPS. And last but not least make sure that you configure ADFS to accept cert based auth. In ADFS 2016 its a little checkbox under authentication types. Today I want to go over an experience I had with a client setting up Certificate Based Authentication (CBA) to Exchange Online. 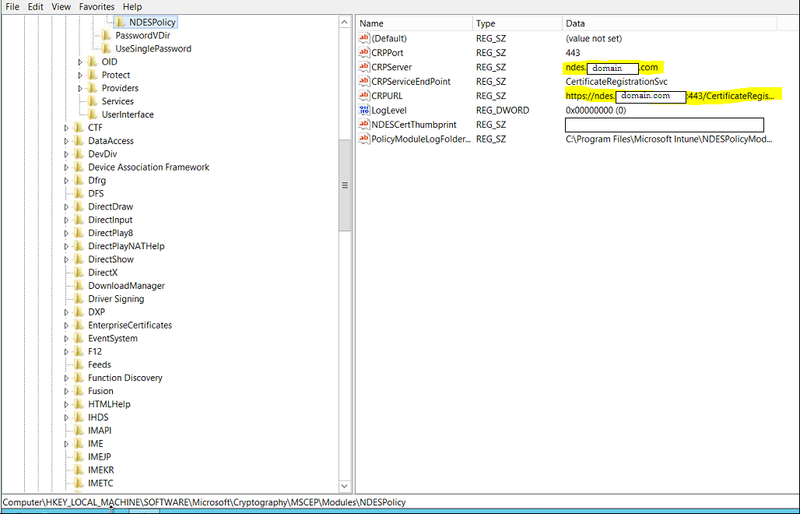 The issue I ran into comes from the use of a trusted public certificate to secure the IIS server and Intune Certificate Connector instead of one from your internal PKI as in the steps Nickolaj provided in his blog. By default the NDES Server places its own DNS name in certain registry values that it expects the certificate to have. When using a public cert we need to change those values in the registry. The values that hold the server name should be changed to the namespace on the public cert. See example below. Client information has been removed but you get the idea. After this change was made our SCEP certificates were getting to the devices. Hope this helps someone out there that may be hung up on this issue. Got a guest post from a colleague of mine today. Erick Purkins is a Microsoft consultant out of the Houston Texas area and he did a write up of a recent issue he saw. Enjoy. I just wanted to share an experience and issue with everyone this morning. I am currently working with a customer to upgrade their Exchange 2010 infrastructure to Exchange 2016. During our discussions, we talked about correct service pack levels and OS’s required, etc. One thing I didn’t think to talk about was “FAILED EXCHANGE SERVERS”. Just curious if anyone brings this up? This is important because during the installation of their first 2016 server I received a rather odd error. It was the “Update-RmsSharedIdentity -ServerName $RoIeNetBIOSName was run: "Microsoft.ExchangeData.DataVaIidationException: Database is mandatory on UserMaiIbox.” That led me to the issue. Apparently at one time or another they had an Exchange server go belly up. Instead of fixing the issue they turned it off and forgot about it, eventually having someone go in and remove the server through ADSI. Now normally this wouldn’t have been much cause for alarm, but after reviewing the error message and a little google-fu I realized they had no arbitration mailboxes and this was what the error referred to. So How did I fix this issue? First, I reviewed how to recreate Arbitration mailboxes. Something I have done before but not in a while. OK seems easy, right? Wrong. Since I had previously run the Exchange 2016 setup it had ran /prepareAD and updated the schema. So I could not run the Exchange 2010 SP3 with /PrepareAD to recreate the mailboxes. Where to next? I guess I’ll have to use the Exchange 2016 Media. After successfully removing the Exchange installation I removed the AD objects associated with Arbitration mailboxes and re-run Setup.exe /prepareAD. All the correct mailboxes were recreated in the Default Users container as they are supposed to. After recreating the mailboxes with the Exchange 2016 Media I followed what I would normally do and re-enable them through the shell. Okay new error, WTH? You mean to tell me I can only do this through the Exchange 2016 Shell, but I haven’t gotten a server even installed yet. Now we have a Chicken or the egg situation. 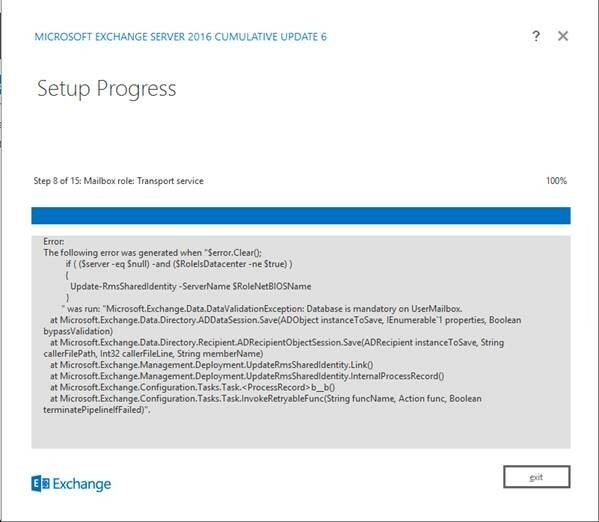 Do we try and install Exchange 2016 again? You Feeling Lucky? That was the only thing I could think of to do and the internet was no help with that question. So I ran setup again and prayed to the Microsoft gods while crossing everything and holding every lucky charm I could find. Must have been the lucky rabbits foot, because this time around we were successful at installing Exchange 2016. After rebooting the server all arbitration mailboxes appear on the new Exchange server. Talk to your customers about failed or improperly decommissioned servers. Double check your arbitration mailboxes prior to any upgrade. It may just save you a few hours of Google-fu. Also, always keep a lucky rabbits foot close at hand. Let's talk about Azure AD Conditional Access for a second. Its deceiving, like rob you in the night after you thought you were friends deceiving. I say this for two reasons. 1. In the rules for Conditional Access there is an option that is labeled 'domain joined'. This is misleading. 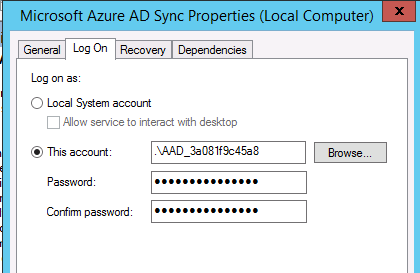 What this is really checking against is if the device is registered within Azure AD and domain joined. If the device is domain joined but not registered then it won't honor the conditional access controls. Registration can happen automatically for domain joined devices once some configuration is done on prem (more on that later). 2. 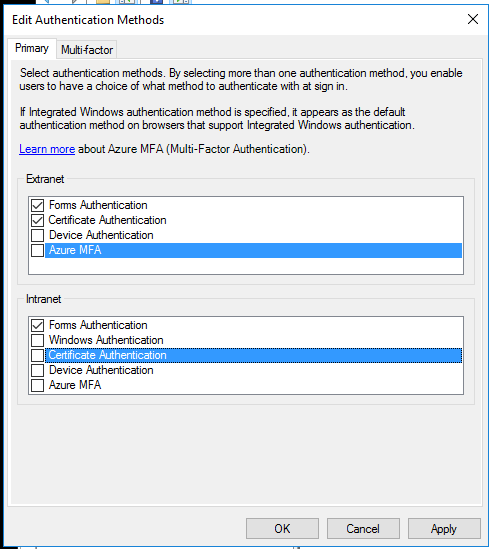 Conditional Access only supports applications that use modern auth. This wouldn't be so big a deal if when you enabled Conditional Access it disabled legacy authentication methods. It doesn't. What this means is all your fancy layered rules can be defeated by someone in China firing up Outlook 2010 and using a compromised account. Don't believe me? Take a look here. Microsoft's suggested fix is to stand up ADFS and use claims rules to block legacy auth....not much of a fix in my opinion. I want to circle back around to point number 1 and talk about how to do automatic registration of domain joined devices. What I do want to touch on is some scenarios I had thought about when doing this. First some background info on how the registration works. Windows 10 devices have the logic to join Azure AD baked into the OS. You configure your SCP point and configure ADFS if you have it and you're off to the races. Windows 7 devices are a little different. They require a small MSI package to be ran to force a registration since they do not have the baked in logic. What I found when testing these guys is that they are tied to a user, whatever user's login triggers the join gets the device put in their name. This means that only users that are being synced into Azure AD can register. Gotcha #2. If a non synced user tries it will fail silently. What is interesting though is that if a synced users stops syncing or gets removed from Azure AD the device will remain and not be associated to any user, like the Windows 10 devices. So huge wall of text. Here's a picture of my devices and the output of dsregcmd /status on a successfully joined Windows 10 machine to make it all better. I have recently been doing a lot more Intune work and ran into a small gotcha that was not documented by Microsoft anywhere. I am not going to dive into the details of setting up an NDES server or PKI infrastructure, god have mercy on you if you have to do this and dont know how, but what I will do is link you to some good articles. The official document from MS - Take heed my warning comment and the one from Sassan! Both very similar documents but the second one is easier to follow and a little more fleshed out in my opinion. This is where you create the certificate that the Intune Connector is going to use. What it doesnt tell you is that this connector does not accept certs issued with a template above schema version 2. So if you are using custom templates and are on more than schema 2 do not copy from that template, use the built in template. The Intune Connector does not tell you why the install fails, only that it does. 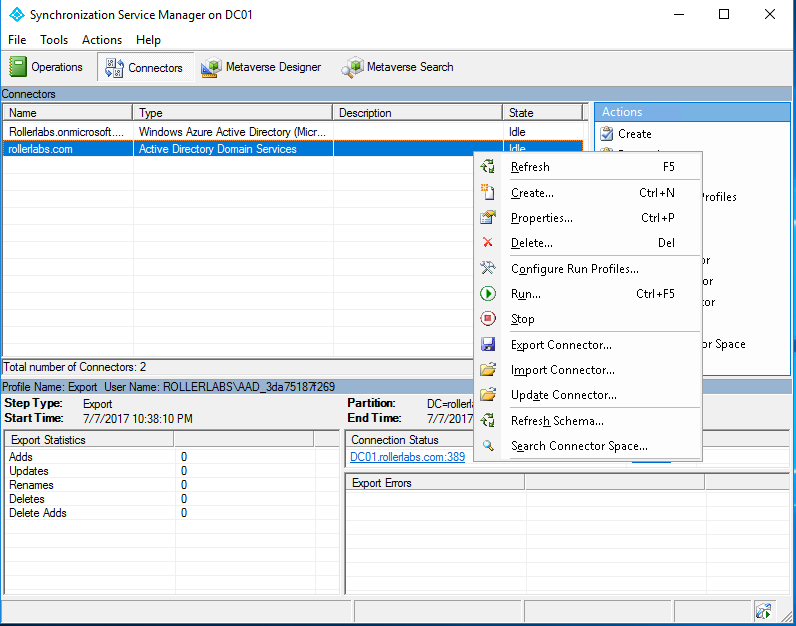 This installment I have a write up on an error a co-worker encountered in AAD Connect. All credit for write up goes to an engineer by the name Cody Rowe, reposted here with permission. Thanks Cody! Issue: Server had not been restarted for a very long time. Customer needed to install updated VMWare tools for their backup solution. On reboot, the ad sync service could not start and gave off this error. That led me to a few thoughts after doing some searching. · An update was installed after reboot. Maybe this broke the service. · The local service account used to start the ad sync service was affected by the reboot. Now I went through the process of abandoning the previous encryption key and adding in a new one. Run miiskmu.exe located in the Bin folder for the ad sync directory with elevated permissions. You'll want to select Abandon key set, then provide the credentials for the local service account. When the operation is complete, stop the ad sync service since it will automatically start and attempt to create new encryption keys. 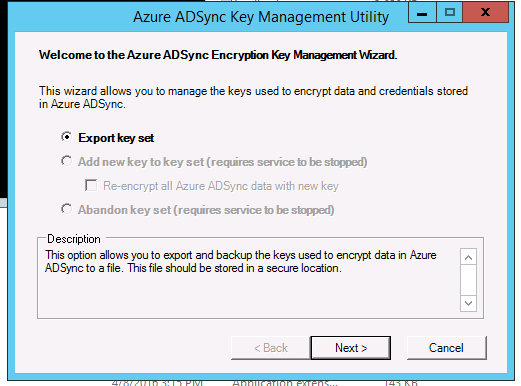 Go back to the key management utility and select add new key to key set. I opted to select re-encrypt as well. When that finishes start the service and open powershell. Run the following. After this ran I was getting some errors I did not expect to happen when it was healthy. Specifically the stopped-extension-dll-exception is what I'm concerned about. Going to event viewer it appeared that I was getting password issues with the service accounts. I reset passwords for all the service accounts (AD for both forests, Cloud service account for machine) and added the updated passwords to the connection credentials for all 3 connectors. After that I ran another delta sync, and everything came back clean.